Back in 1977, no one had ever heard the term “Lynchian.” In fact, no one had ever heard of David Lynch. The director of The Elephant Man, Blue Velvet, and Mulholland Drive had never made a full-length movie when Eraserhead arrived on the scene. But the cult horror film quickly seared a number of black-and-white images onto fans’ brains—chiefly, Jack Nance’s wild hair and that grotesque “baby” at the center of the story. In honor of its 40th anniversary, here are 12 gross, trippy, and terrifying facts about the midnight movie classic. 1. DAVID LYNCH ACTUALLY WANTED TO MAKE A MOVIE ABOUT INSECTS AND ADULTERY. 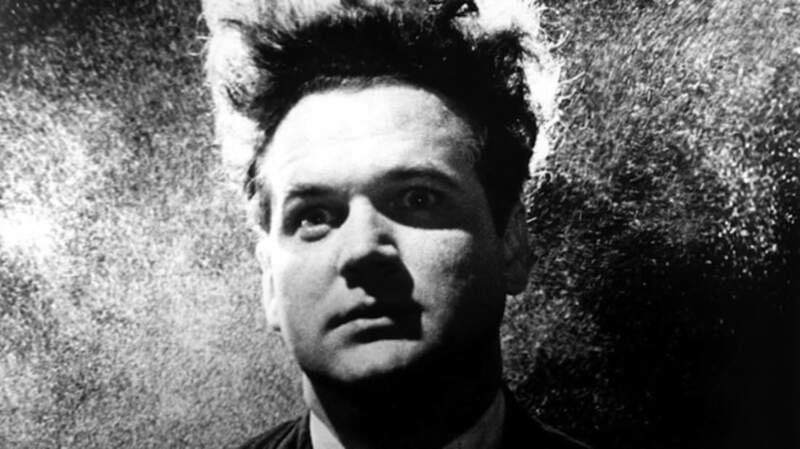 Eraserhead is technically a student film, since Lynch started making it while he was studying at the American Film Institute’s Center for Advanced Film Studies. But if things had gone a little bit differently, his first feature would’ve been Gardenback, not Eraserhead. Gardenback was a 45-page script that came from one of Lynch’s paintings of a “stooped figure with green things growing out of its back.” The screenplay concerned a couple named Henry and Mary. When Henry looks at another girl, “something crosses from her to him.” It’s a bug, which proceeds to grow into a monster in Henry and Mary’s attic. 2. ONE LINE IN THE BIBLE INSPIRED ERASERHEAD. 3. NO, LYNCH WASN’T WORKING OUT HIS ANXIETIES AS A NEW DAD. 4. HE DISSECTED A CAT FOR RESEARCH. To prepare for the shoot, Lynch decided he needed to look at a dead cat’s membranes, hair, and skin. It was apparently a texture thing. 5. PHILADELPHIA INFORMED THE MOVIE’S IMAGERY AND SOUND. Lynch moved from his hometown of Missoula, Missouri to Philadelphia to study at the Pennsylvania Academy of the Fine Arts in 1965. The city had a profound effect on him—though not necessarily a positive one. “The biggest influence on my life was Philadelphia, Pennsylvania,” Lynch later told Philadelphia Weekly. “I loved the fact that Philadelphia had a mood, and that mood was dark and foreboding. I felt industry. I felt smoke and fire and fear. I felt insanity. These things that I felt influenced me." Lynch has said that “industrial world” directly shaped the Eraserhead’s feel and sound. 6. IT TOOK FIVE YEARS TO FINISH THE FILM. 7. LYNCH PAID FOR IT WITH HIS NEWSPAPER ROUTE. To make ends meet, Lynch took a paper route; he delivered The Wall Street Journal during production, which earned him an extra $48 per week. This wasn’t actually a “day job,” as his route was scheduled during the night. Lynch also insisted on shooting Eraserhead at night, so at some point each evening, he’d have to suspend shooting to go complete his paper route. 8. SISSY SPACEK HELPED OUT ON SET. Jack Fisk played the so-called “Man in the Planet,” and sometimes invited his girlfriend to the set. That girlfriend (and later wife) just happened to be Sissy Spacek. She would hold the slate while Fisk was on camera, which is why she received a “thanks” in the credits. 9. A TORTURE SCENE WAS CUT. Lynch claims he cut three or four scenes from the final print, and one was a strange sequence where the main character Henry looks into a room with two women tied to a bed. They were not alone. There was also a man holding an electrical box with large cables and sparks leaping off it. He moves toward the women before the scene cuts, leaving his intentions to the imagination. 10. LYNCH WILL NEVER TELL HOW THE “BABY” WAS MADE. Fans have speculated about how Lynch made the deformed baby prop (nicknamed “Spike”) for decades. Some say it’s a lamb fetus, others think it’s a skinned rabbit. But they might as well keep guessing, because Lynch has repeatedly refused to reveal its origins. Same goes for Jennifer, who won’t even tell her own daughter. 11. THE INITIAL REVIEWS WERE NOT KIND. Eraserhead was not an immediate critical darling. In 1976, Variety called it “a sickening bad-taste exercise.” And that was a relatively early review. Eraserhead screened almost exclusively as a midnight movie for a couple years, but when it went wider in 1980, Tom Buckley at The New York Times was no fan, either. He dubbed it a “murkily pretentious shocker” with an “excruciatingly slow pace.” Ouch. 12. BUT MEL BROOKS LOVED IT.